Mount Anville claimed the Leinster schoolgirl’s junior cup title this afternoon at Grange Road, beating Mount Sackville by a single goal. 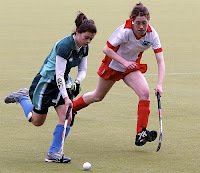 Aisling Naughton scored midway through the second half to take the honours. Wednesday afternoon sees the second day of schoolboy finals, tipping off first with the developing school’s encounter between St Mark’s and Sandford Park at 12pm. The U-13 final between St Andrew’s and Sutton Park follows at 2pm before the Booterstown school play Wesley in the junior match at 3.45pm.